Announcing: Scoping of environmental issues for the proposed Lake Powell Pipeline Project in Utah and Arizona. Please direct any questions about the licensing of this pipeline to Jim Fargo at (202) 502-6095, james.fargo@ferc.gov. Click here to review the Scoping Document by the Federal Energy Regulatory Commission. Click here to study the project documents from the website of Utah Division of Water Resources. Comments due July 7, 2008. 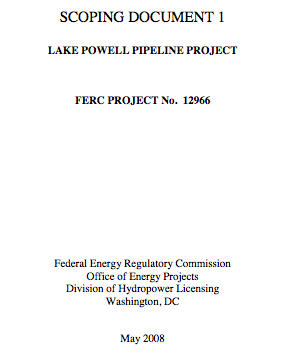 SUBJECT: Scoping of environmental issues for the proposed Lake Powell Pipeline Project, FERC No. 12966, Utah and Arizona. prepare the environmental record needed by other federal agencies reviewing the project. follow the instructions included in section 5.0 Request for Information. of the issuance date of SD1. scoping meetings will be held at the Dixie Center, 1835 Convention Center Drive, St.
information on the meetings is available in the attached SD1. details on the site visit, including the person to contact if you are interested in attending.